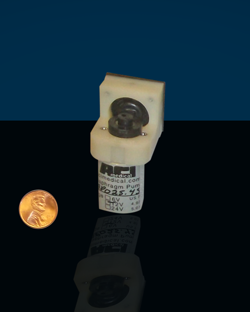 ACI Medical is an FDA registered company that produces high quality miniature diaphragm pumps for use in a variety of medical and non-medical applications. Our pumps have air, vacuum and liquid capabilities. We specialize in pumps with low voltage (6, 12, 19 and 24 DC), flows up to 10 LPM, pressures up to 35 PSI and vacuum up to 26 inches of Hg. Our diaphragm pumps are available in a wide range of materials. ACI has patents on different aspects of pump designs that make them suitable for many diaphragm pump applications. The combination of our expert engineers, who are available to assist with product development, and our design laboratory and machine shop, can rapidly produce virtually any type of diaphragm pump prototype. Product flexibility – ACI has the ability to make molds and parts in a wide variety of materials on the premises. 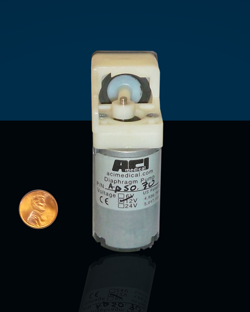 ACI is very knowledgeable on pump requirements in the Medical and Industrial Hygiene Industries. Our pump engineers have experience working with customers to better meet their requirements and solve their problems. ACI has patents on aspects of pump design that make them particularly well suited for all diaphragm pump applications. 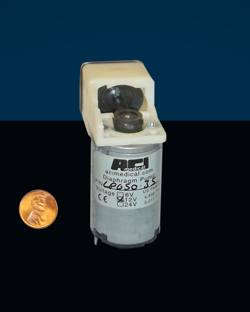 ACI has design laboratory and machine shop capabilities that can rapidly produce virtually any type of pump prototype. 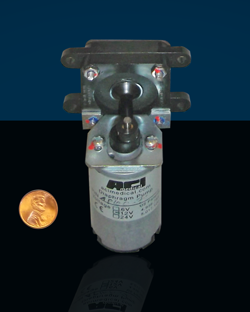 Mounting compatibility for all competitive pumps is available. ACI can provide the best delivery time in the industry. Factory adjustable stroke volume minimizes noise and power consumption while prolonging motor life. Made in USA with shorter lead times, custom design assistance and engineering support. Patented design will not generate debris on inside of diaphragm which will foul internal and downstream valves (U.S. Pat. #4,936,758). Patented internal valve design minimizes back leakage (U.S. Pat. #5,017,100). Internal air filter, oiless and maintenance free. Choice of DIAPHLEX™ long life diaphragm material or Neoprene.